Controversial: The Truth Behind Tagaytay Car Crash Who Killed 6 Teenagers! 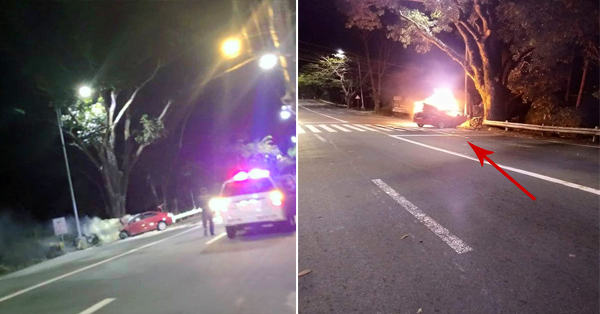 There are four graduating high school students by next year of one school in Imus, Cavite who died along the Tagaytay area in front of a Starbucks coffee shop because of unexpected car crashed. The victims were John Russel Garcia, 15; John Paul Tena, 15; Kirby Bokingo, 16; Jaymee Gubaton, 16; Lauren Bren Calabines, 16; and Rodalyn Bautista, 17. Calabines was identified as the driver of the car. It's really sad to say that all of these teenagers just wanted to go on a trip carrying the Toyota Vios car without any right permission with their guardians. And since all of them are still young, no one has a license to drive this car. According to some witnesses, the car was on its high speed when it suddenly shakes and hit the concrete barriers, then lose control and hit the tree and post, it is anchoring the news reported on GMA channel. But one witness appeared on Facebook and reveals the truth behind what happened. She claims that there are a lot of mistakes happened that should not be done by the authority and some group of witness, Time are just wasted instead of using it to save the people inside the car during that time. Read how Dennise Ann Castillo stated the whole incident.